Diane Bresson, is a talented graduate from Central St Martins, London. An Award winning Designer, scooping up the Dulux UK Colour Design Award at the New Designers exhibition. Bold and Retrospective, Diane's graduate collection gives a nod to the iconic patterns of the 1970's, and screams technicolour! Almost neon, strong black geometrics mixed with halftones and bold primary colours, sympathetically blended to create layered graphic textures and colour blocked patterns with an impressive impact. Perfectly coloured, and each shape balanced to perfection, Dianes patterns stand out from the crowd and offer a refreshing, inspirational mix of both traditional and contemporary print technologies. 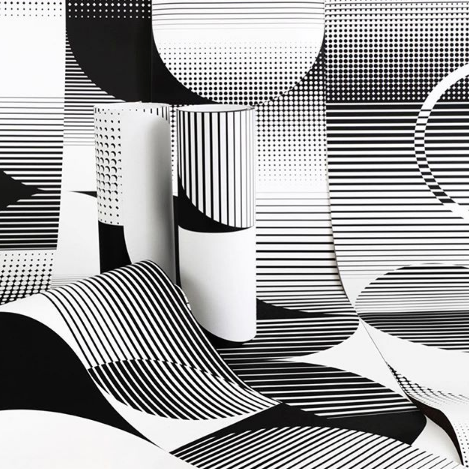 More than just wallpaper: Diane's designs make a pleasing Artistic installation, for Interiors. What / Who Inspired your gorgeous collection? My project draws inspiration from combination and dissection puzzles, especially the Tangram, whose purpose is to arrange seven shapes into one larger composition. Following this principle, I utilised simple geometric shapes, spontaneously and playfully overlaid and combined together through screen printing. I combined primary colours often found in puzzles and toys (red, blue, yellow, green) with colours and gradient from the 'rainbow effect' happening when filming projected imagery with a camera. I screen printed two 10 meters long wallpapers without a precise plan, I was just playing with my screens, stencils and colours. That is usually how I like to work with screens. If I make a mistake then I can easily improvise and print something on top, and sometimes 'mistakes' turn out great! From this process, I designed a series of black and white wallpapers that were digitally printed on ultra mat wallpaper. I think differently when working with Illustrator, for example, than with screen printing, and I like working with both at the same time. The exploration between digital and traditional creation is a driving factor in my work. A coloured animation was also projected onto the monochrome prints, bringing them to life and creating dynamic patterns. As a creative, how do you create your patterns (techniques, software used) and, What’s been the biggest challenge so far? As I mentioned above I like working both digitally and traditionally. I experimented with programming and random computer generated patterns with my previous project, but I also worked with these patterns in screen printing. For my graduate collection I started with small coloured perspex pieces in the shape of the Tangram pieces, and applied vinyls onto them. I then photographed them with screen printed mirror card. Working with both processes at the same time allow them to inspire each other. If I feel like I am stuck with screen printing then I would experiment with my computer, and vice versa. I use a variety of processes to generate digital patterns (photographs, programs,..) but then I mostly use Adobe Illustrator to modify them and experiment with shapes and colours. The main challenge for me with working both digitally and traditionally at the same time is colour management and keeping a consistent colour palette between the computer screen and the paints and pigments. Your designs would make fabulous Interior fabrics, are you thinking of producing Textiles? I am interested in creating exciting patterns and even though for my graduate collection they were printed on wallpaper, I do think they could be applied to many different surfaces, including textiles. What’s next for Diane? What’s your dream job? Or will you set up your own Brand? For now I'd like to gain experience and try different things to eventually set up my own brand or work as a freelance. I am thinking about producing my graduate collection in small quantities so I am working on finding the ideal digital printer and material, and adapting my screen printed lengths into digitally printed wallpapers. I also want to continue to explore new and exciting ways of bringing patterns to life, perhaps by experimenting with large-scale installations involving video, animation, and sound. Thanks or sharing your inspiration with us Diane. Digital technologies combined with traditional techniques offer unlimited creativity to the next design generation and we wish you every success for the future.